Acknowledged author Jacqueline Burchum DNSc APRN BC wrote Lehne's Pharmacology for Nursing Care, 10e comprising 1456 pages back in 2018. Textbook and etextbook are published under ISBN 0323512275 and 9780323512275. 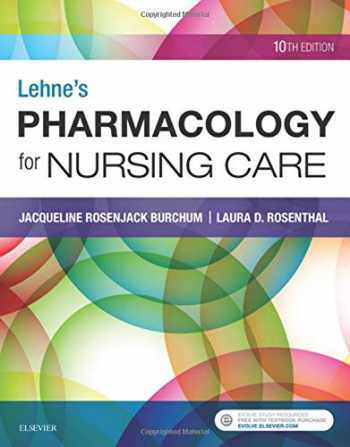 Since then Lehne's Pharmacology for Nursing Care, 10e textbook received total rating of 4 stars and was available to sell back to BooksRun online for the top buyback price of $48.43 or rent at the marketplace. With a clear explanation of drug prototypes and how they work, Lehne's Pharmacology for Nursing Care, 10th Edition gives you the background you need to understand drugs currently on the market, and those not yet released. This perennial favorite of students and teachers simplifies complex concepts while distinguishing need-to-know content from the material that’s merely nice to know. The 10th edition includes updated drug content to reflect the very latest FDA approvals, withdrawals, and therapeutic uses, as well as corresponding updated nursing content. It also includes an updated prototype drugs section, summarizing their major uses, and an updated table detailing care throughout the lifespan of the patient. Additionally, each chapter ends with a nursing implications summary to help you fully understand the material and apply it to clinical nursing practice.Prototype Drugs features serve as a quick-reference learning aid so you can apply your understanding to related drugs currently on the market as well as drugs that will be released in the future.UNIQUE! Engaging writing style with clear explanations makes difficult pharmacology concepts easy to grasp and even enjoyable to learn.Nursing implications of drug therapy are integrated throughout the text to reinforce the integral relationship between drug therapy and nursing care.UPDATED Special Interest Topic boxes focus on currently trending issues in pharmacology, eliminating out-of-date content.Large print highlights essential, need-to-know information, and small print indicates nice-to-know information.QSEN focus includes Patient-Centered Care Across the Life Span features highlighting safe and appropriate patient care during different phases of life.Safety Alert features emphasize the QSEN competency relating to patient safety. Student-friendly features make learning easier with concise drug summary tables, chapter outlines, key points, and a visual guide to the prototype drugs in each class. Concise drug summary tables present detailed information for individual drugs, including drug class, generic and trade names, dosages, routes, and indications. Selected Canadian drug names are indicated with a maple-leaf icon throughout the text.Separate Bioterrorism chapter discusses the clinical manifestations and treatment of biological weapon attacks.NEW! Thoroughly updated drug content reflects the very latest FDA drug approvals, withdrawals, and therapeutic uses, as well as corresponding updated nursing contentNEW! Additional images included to accompany difficult concepts.NEW! Inclusion of more student practice questions provide additional help for learning the material.